The Great Journey (4605 F.A.) - After the Battle of the Powers ended and Melkor had been imprisoned, the Valar sought to protect the Elves. Sauron escaped and evil still lurked upon the Earth. The Valar felt the Children of Ilúvatar would be safer in their own realm, Valinor, the Undying Lands. And so they sent Oromë, The Great Rider of the Valar, to Cuiviénen. Thus began the Great Journey. But not all Elves were anxious to leave their home; and still others wandered along the way, leading to the Sundering of the Elves. "Then befell the first sundering of the Elves. 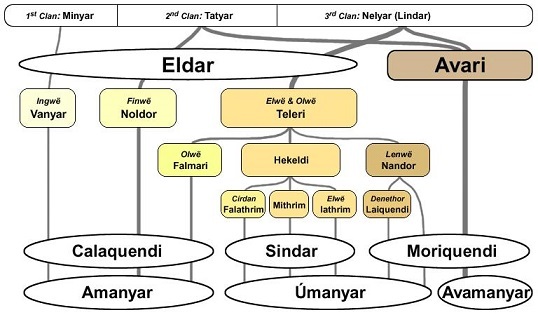 For the kindred of Ingwë, and the most part of the kindreds of Finwë and Elwë, were swayed by the words of their lords, and were willing to depart and follow Oromë; and these were known everafter as the Eldar. 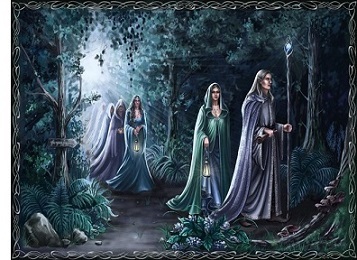 But many refused the summons, preferring the starlight and the wide spaces of Middle-earth to the rumour of the Trees; and these were the Avari, the Unwilling. "...they were arrayed in three hosts. The smallest host and the first to set forth was led by Ingwë, the most high lord of all the Elvish race. The Vanyar were his people. "Next came the Noldor, a name of wisdom, the people of Finwë. They are the Deep Elves, the friends of Aulë; and they are renowned in song.